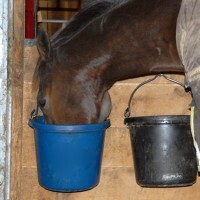 Does your horse treat his meals like a buffet, picking and choosing what to ingest? We’ve all been there, watching our horse pick through his grain with those incredibly dexterous lips, sifting out the pricey supplements or necessary medication. Or, he might just turn up those lips at every grain you serve him, confounding your best efforts to provide him with the best nutrition money can buy. You’ve got a picky eater on your hands. You buy him the best foods and supplements, and provide the best care, but at meal-time your efforts and dollars are snubbed. Liv Gude of Pro Equine Grooms shares some strategies to help turn your picky eater into an omnivore. We can look at this from several angles, and this will help you formulate a plan as to how to best manage a picky eater. Is your horse suddenly a picky eater or has this been his way of driving you batty all along? A horse that becomes a picky eater quite quickly can often be telling you something about his physical health. It may hurt him to eat, so involving your veterinarian to rule out possible causes is a good idea. It may be a dental issue, a digestive issue, an ulcer issue, or even a lameness issue. He could also be trying to tell you something about his environment. Did you change barns or even stalls, change feeds, change his hay, change his schedule, change his neighbors, or change his exercise routine? Digging into possible environmental factors can also give you clues as to what might be going on. When you have some ideas about what may have prompted this pickiness, you can try and normalize things or treat them medically to entice him to be his normal self and get back to cleaning his plate! If his sudden pickiness is attributed to a change or addition of feed, perhaps the rate in which you switch the feeds can be slowed down. If you have added a new supplement, increase the dose gradually. Adding water is a good idea, here, too. For medicines, you may just need to mix with water and dose him with a syringe to assure proper dosage. If you have a chronic picky eater, it may just be part of your horse’s personality, in which case you have some things you can try. Give him the food that he needs to eat when he is the hungriest. If he’s picky about supplements, don’t give those at night after he’s had all day eating hay and pasture. Don’t let him train you into becoming his personal chef. Horses do this by snubbing their food, knowing that you will replace it with something possibly yummier. Or you will add flavors like molasses! Or cookies or carrots or sugar cubes! Sometimes, a picky eater is “cured” by walking away and not offering any other options. Consider adding water to his hay or grain. This has the extra bonus of adding valuable hydration, and also allows any supplement flavors to be evenly distributed and hidden by other stuff in his bucket. If he lives in a herd, investigate separate feeding options to eliminate any stress he may have about other horses bothering him when he eats. In some cases, the opposite may be true, and he will feel protective of his food, despite his picky inclinations, and be more motivated to eat if he has neighbors around that may steal his meal, even if separated by a fence. Consider working with an equine nutritionist to make sure that what you are offering is actually a complete and balanced diet. Horses can be savvy about what they are eating, so a diet out of balance may cause some pickiness. Generally speaking, if your horse is a picky eater, and he’s on the skinny side or losing weight, it warrants a call to your veterinarian for help. If he’s in good condition and just causing you to tear your hair out, experiment to see what little changes to his routine and diet might work.